This machine is designed for drilling the vacuum channels inside the moulds. 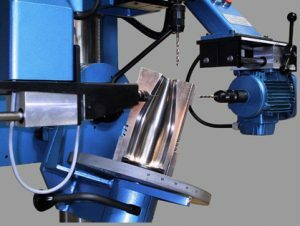 The Sonicam Vent Drilling Machine has two opposing spindles on one axis, that allows to drill and counter drill without moving the mould. The left spindle for drilling the vent hole is very sensitive which makes it easy to drill even the smallest diameters with almost no risk of breaking the tool. The moulds are fixed on a swivelling table by a jaw with the shape of a disk fitting in the bottom plate seating of the mould. The table can move vertically, it can swivel and rotate in any position. Thanks to a third vertical spindle, it is possible to interconnect the vent holes.